The vineyard of 23 ha was bought back in 2013 by Bernard Cambier, Agricultural engineer. Here, the permanent concern is to respect the vine and the ground, where from the practice of a reasoned culture. 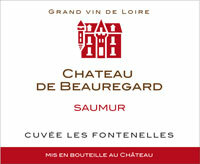 We bring up this excellent red Saumur, in the notes of blackberry, good skeleton, very good evolution. Several other wines are remarkable as soft Saumur and vintage Elegance: Saumur Brut which is produced only the years when the quality of basic wines is big. This special vintage arises from a rigorous selection of grape harvest, a separate wine making, a subtle assembly of Chenin, Chardonnay and frank Cabernet. This vintage which represents all the knowledge of the Château de Beauregard is only distributed at certain wine cellarman's and its reservation is established for year. The Château de Beauregard distinguishes itself besides by an exceptional value for money.